How does this relate to the Oak personality, and what can happen when it becomes out of balance? Oak personalities are strong. In fact, they're so strong that they never want to be dependent upon others for any reason. They're often seen as the one person in a firm or a family that can always be relied upon for their strength and their take-charge abilities. Of course this strength can become a liability, and once in a negative state, it becomes too focused on it’s own outward strength, and loses touch with it’s inner voice. Life becomes focused on achievement, to the exclusion of the playful or gentle sides of life. Before long, life becomes more duty and drudgery than joy, and the negative Oak personality goes into a crisis state. This could be a nervous collapse or a physical illness. The good news is that when an Oak personality recognizes that they’re in a negative state, they’re often the kind of take charge person who will take corrective steps. Taking the Bach Flower Essence Oak is one of those steps. 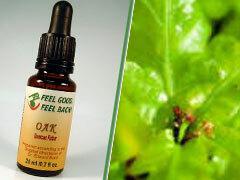 By taking Oak, this personality can remain strong, while allowing the joys of life to accompany the duties. Now they become both as strong and as flexible as an Oak. If you're not sure that this is the correct Bach Flower Essence for you, visit FeelBach! and take our questionnaire. You do owe it to yourself to enjoy this life!